As this game forms a miniseries, with several missions presented as single episodes that are only partially connected to each other, I am going to comment on them separately. The Enterprise finds the heavily damaged U.S.S. Alexander that has travelled back from the future. Her captain Luke Rayner reports that the Federation will be destroyed in eight days shortly before his ship explodes. The Enterprise traces the course of the Alexander back to Espoir research station, where a landing party consisting of Kirk, Spock, and McCoy is taken prisoner by Elasi. They are commanded by Dr. Breddell, who was able to escape the destruction of Enterprise-2 by means of a cloaked Elasi frigate. Their plan is to tap a local phenomenon that can also cause temporal anomalies as the power source for a doomsday weapon. The landing party can convince the Vardaine security crew on Espoir station that Breddell is not acting in the best interest of the Vardaine and thereby manages to destroy the weapon and detain Breddell. When the Enterprise is ready to leave, the U.S.S. Alexander that has been sent by Starfleet to assist Enterprise approaches. The first episode of Judgment Rites jumps right into a dramatic adventure, as already Kirk's very first log entry is interrupted mid-sentence by the appearance of the U.S.S. Alexander. From that moment till the landing party is put in the brig on Espoir Station, everything feels a little bit rushed. The rest of the story plays out at a slower pace, and almost gets a bit tedious as it feels much like a series of contrived obstacles rather than true challenges. Mostly, the landing party can talk their way out of imprisonment, and this works with surprising ease. Of all security staff on Espoir Station, the guard assigned to keep the landing party from escaping happens to be the son of Kirk's contact back when he exposed Breddell's unethical plans ten years ago. The promise of clearing his father's name from being a traitor brings that guard on the landing party's side, while the security chief (and thereby most of the rest of security staff) can be convinced simply by showing some evidence of Breddell's true plans to him. With a statement in the style of "I hate to help you, but my culture's moral code obliges me to, now that I have seen this evidence. ", this does not come across as convincing at all. While this part of the story feels rather disappointing, other small tasks to do on the station still show some diversity, and the station itself is not too monotone to inspire boredom, either. After Breddell was barely introduced in the last episode of 25th Anniversary, we now learn a bit more about his backstory with Kirk. Apparently, the "unethical practices" Kirk helped expose were a plan by Breddell to overthrow the Vardaine Council. So, it was a coup d'état, not unethical research experiments (although these are implied to be happening now, with the experimental superweapon and the genetically augmented beast). How all this connects Breddell to the Elasi (who will not appear again after this episode) is not explained. According to the aforementioned guard, his father was executed nine years ago (roughly one year after the contact with Kirk) for trying to reveal the Vardaine starship program. This must refer to the Vardaine building of Constitution class starships. That means, the clandestine construction of unofficial Constitution class starships has been going on unnoticed for nine years? The dialog makes it sound like Breddell was already one of the people behind the Vardaine starship program back then. Nonetheless, the decision to make one (the first?) of the Vardaine Constitution class vessels a copy of the Enterprise must have been a later idea, given that ten years ago, Kirk was still an insignificant Lieutenant on the Farragut rather than the captain of the Enterprise, and that has probably not significantly changed within the one year until Vakada's execution. Overall, the story is mildly entertaining, but does not get really exciting, even though the whole Federation is said to be at stake. It does not become clear anyway how the weapon could be used to "destroy the entire Federation" (presumeably while having the Vardaine survive), so the threat remains quite abstract. Curiosities: In 25th Anniversary, Dr. Breddell was still spelt Bredell, with one 'd'. Remarkable vessel: The airlock room on Espoir station has a window facing a shuttlebay, where something that looks a lot, but not exactly, like a TOS shuttle is stored. In the airlock room, the landing party can first open the outer door of the shuttle bay and then pump out the air. During TOS, the atmospheric forcefields seen from TNG onwards did not seem to exist yet, so there should be no need to pump out any air after opening the outer hangar door that leads directly into space. The guard in the computer room on Espoir Station says he has locked the computer into a diagnostic cycle so the Enterprise party are not able to use it. On the other hand, according to Spock's explanation and the puzzle to solve, the computer is not blocked by a "diagnostic cycle", but by an infinitely running match of 3D chess that the computer plays against itself. Remarkable background detail: In Breddell's quarters, a dart board at the wall is decorated with a picture of Kirk's face. In the beginning of the episode, the original destination of the Enterprise was the Glorious Pebbles Scientific Academy. The primary mission of Espoir Station is to study Gravity's End, the only known proto-universe phenomenon in the galaxy. A proto-universe phenomenon is described as a place that matter from a big bang that is happening in another universe is displaced to. Remarkable animal: The two-legged, four-armed Antarian mankiller, described as one of the most dangerous predators in known space. Spock implies that some of the predators on Vulcan are even deadlier. The U.S.S. Demeter is observing a stone age civilization on Balkos III when it is scanned from the surface of the planet. A landing party from the Enterprise beams down to the coordinates from where the scan originated and finds an underground research facility with advanced technology. Gradually, it becomes clear that the whole facility has been deliberately set up for the landing party, who are soon faced with the choice between either getting access to a database full of valuable advanced technological knowledge, or shutting down the machinery and thereby preventing the release of a substance into the atmosphere that would condemn the Balkosi to a future in permanent violence. While the premise of visiting the planet is rather convincing for once, not much happens once the landing party have arrived there. Kirk, Spock and McCoy have to combine and transform various of the objects found in the underground facility. Much of the episode is not tedious to follow, but does not make much progress story-wise, other than showing increasingly clearly that the whole mission is a large puzzle for the landing party. Nonetheless, the turning point when Kirk concludes that everything looks like a test, with the landing party being the subjects, makes for a good scene. While there is always a certain amount of squabble between Spock and McCoy, it becomes rather extreme in intensity in this episode. While examining the alien technology, almost every action prompts another small dialog between the two. I was relieved when I realized that this dialog was intentionally written to become increasingly heated in this episode, as the biologic agent tuned to make the Balkosi more aggresive seems to have a slight effect on the landing party, as well. The final test makes viewers wonder who would go such lengths just to test the landing party. In particular, one has to wonder about that as the test is only good for "one use", and there is no indication the landing party is in any way representative for any larger group that might be tested (such as the crew of the Enterprise). In any case, the ominous on-screen message at the end of the episode, "SUBJECT SUITABLE"/"TESTING CONTINUES", foreshadows that we will find out more about who is behind this apparent experiment. At various points of 25th Anniversary and Judgment Rites, I got the impression of looking at a version of TOS with somewhat improved storytelling. One aspect of this is how characters outside of the Kirk-Spock-McCoy trio get more to do, as becomes visible here, when the episode starts with some banter on the bridge that involves all seven of the TOS crew. Based on seeing a disabled viewscreen comparable in size to the main viewer on bridge, Spock concludes that the intended users have substandard vision. Even when ignoring whether there can be a "standard degree of vision" of some kind in a community of many unrelated species like the Federation, it is impossible to draw any conclusions about vision when only the overall size of the screen is known, rather than its effectively used resolution, color depth, and frame rate. The mysterious message about the continuation of the experiment appears on screen. A few moments later, it is replaced with an incoming transmission from Starfleet, and Admiral Richards thanks Kirk for his "report" and already refers to the mysterious message. Even though the scene appears to be shown in real-time, we must assume there is an undetermined amount of time in between, as otherwise, Kirk could hardly have compiled a report, let alone mentioned the alien message. Spock says the archive in one of the rooms contains "essentially, everything needed to project lifelike images in great detail inside of a structure. Starfleet does not have this level of technology." This seems to be an allusion to holodecks. In the beginning, Scotty is looking forward to visiting a museum on Nova Atar. He will finally have his chance to see the museum a few episodes later, in "Museum Piece". The U.S.S. Demeter appears to be commanded by a Commander Gellman. It is one of the rare occurrences where the commanding officer of a starship does not hold the rank of Captain. Remarkable genre-savviness: When the Demeter was scanned from the planet, the crew's first assumption was dormant technology of an ancient civilization that might be a threat to the vessel. When the Enterprise is investigating the disappearance of several Starfleet vessels, Trelane attacks the Enterprise with a spaceborne World War I triplane. After defeating him, Kirk, Spock, McCoy and the first officer of one of the vanished vessels find themselves in a romanticized simulation of a German town near the end of World War I created by Trelane. After discovering and destroying a number of Trelane's power objects, the four Starfleet officers are transported into Trelane's castle, where the three disappeared ships and the Enterprise have been shrunk and placed in bottles. Kirk manages to persuade Trelane to look at a realistic simulation of World War I, which makes Trelane reconsider his motivation to play games based on such a setting. But somehow, the stereotypical depiction does not come across as too gratuitous here, as it is actually a plot point that everything is a farcical illusion created by Trelane, rather than a historically accurate representation of the past. The simplicity of the simulated world helps to make the whole place feel appropriately surreal and fake - there is the small cozy town, leaving it to one side brings you to a military hangar and a fairy tale castle, while the other side directly leads to a trench with dying soldiers. Also, at various points, the characters explicitly remark small details are incorrect, such as an anachronistically modern lightbulb. The various obstacles the landing party faces are rather enjoyable to watch, as they are solved while one learns more about the town of Gothos and its inhabitants. There are some surprising and interesting turns, such as Spock's mind-meld with one of the characters - that, in some fashion, means he is also mind-melding with Trelane - and his discovery that all the characters in the simulated world are actually mind-controlled crew-members of one of the vanished ships. The only part of the story that comes across as a bit cheap is the barkeeper Gretel, who first readily divulges to Kirk that she is a spy, just to feel like she has to accommodate all of Kirk's requests because he now knows her "secret". But that may result from the combination of her being a part of Trelane's simulation and having a crush on Kirk almost immediately when she see him (as is implied by the music playing during her first appearance). Well, there was not much personal involvement in this respect, as she only had a few interactions with the landing party. Therefore, the twist in the ending (she is one of the captains of the missing ships) is not quite as strong as if she had been a more important minor character before. uring 25th Anniversary, the different characterisations of minor landing party characters were worked out rather nicely. While the previous episodes of Judgment Rites had only Kirk, Spock, and McCoy on landing parties, this episode gives us Lt. Cmdr. Ellis, the first officer of one of the disappeared starships. We can surmise that he was picked by Trelane specifically for his history with Kirk, so it is not necessarily contrived that among the crews of three disappeared ships, there is one crewmember who has an indirect connection with Kirk: Ellis's academy roommate was killed by the vampire cloud on a landing party under Kirk's command. I see that Ellis was meant to be more than a faceless security ensign and given a more crucial role to the story, but at times, his behavior is really over the top. With his unrestrained hatred for Kirk, an officer that he had not even personally met before, it is a surprise he can be considered fit for duty, let alone refrain from actively sabotaging Kirk's efforts to lead the landing party during the episode. This should have been toned down. This episode has an alternative ending, in which a Mary Poppins-like nanny appears to chastise Trelane for his misbehavior. While it is not as "deep" as the other, argumentative ending, I find it almost more fitting with the rest of the story. The ending in which Trelane is convinced to reconsider his behavior appears almost a bit formulaic in comparison, as if a single drastic demonstration could instantly transform the immature character into a mature, considerate one. Remarkable appearance: Trelane, aboard a red WW I triplane in space, wearing pilot goggles and a spiked helmet, presenting himself as Baron Trelane von Gothos of the German Air Circus. Remarkable vessel: Trelane's Red-Baron triplane in space. Uhura first picks up its engine sound, which seems to be transmitted on communication channels for some reason (maybe this is why spaceships on Star Trek come with sound ...), and describes it as "some sort of insect drone". Certainly the most unusual craft the Enterprise encounters in a dogfight during the game. Curiosity: Spock explicitly lists the English language building signs in the German town of Gothos as one of several inconsistencies in Trelane's simulation. Nitpicking: During the Enterprise's first encounter with Trelane, he was using one power generator disguised as an unconspicuous object (a mirror). Apparently, he has learned now, as he has distributed his power to several objects this time - but why are they hidden across the simulated world rather than safely locked in his castle? At least during "The Squire of Gothos", he did not seem to be interested in providing a "fair game" that the Enterprise crew could actually win. Lt. Cmdr. Ellis holds the positions of the first officer and of the chief of security on the U.S.S. Zimbabwe. Doubling as a first officer while being head of a department (like Spock is the first officer and the science officer on the Enterprise) seems to have been common in 23rd century Starfleet. Trelane's simulation depicts the (fictional) German town of Gothos on October 16, 1918. Kirk is known as the American pilot Lt. Col. Jimmy Kirk, leader of the famous Enterprise squadron. His comrades are Captain Spock and Captain Leo McCoy. The Enterprise receives a distress call from a barren planet. A landing party discovers ancient buildings with genetic engineering equipment and two deposits of microscopic organisms, each represented by a hologram that represents a species of light and of darkness, respectively. Kirk manages to convince the two holograms that their species must merge to survive, and the landing party does just that with the microscopic organisms. A hologram representing the merged lifeform informs the crew they are being tested by a species called the Brassica. The outline for this episode reads like a dull old-fashioned story centered around an overly symbolic idea. The fact that the situation is set up as another test for the crew (a follow-up to episode 2, "Sentinel") barely saves this premise. The set-up just seems much too simplistic. The two completely antagonistic parties of "Alphans" and "Omegans", with traits that so obviously complement one another, leave hardly any other conclusion than a combination in the conveniently ready genetic lab in the same building. Ensign Jons, who joins the landing party as a molecular biologist, does not contribute anything useful, either, beside taking the holograms' outward appearances (as a beautiful angel and as a repelling demon) at face value to further emphasize the dichotomy between the two. Finally, as if to reconfirm that all involved want to get over with this episode, both holograms can be convinced in a brief conversation that they should merge with their perceived mortal enemy. Overall, the scenario is not only thin, but also does not appear to be very well designed. First, the Enterprise receives a distress call from Onyius II, implying someone capable of creating advanced technology must be behind this. Then, Spock's sensors read two faint lifesigns on the planet, which Kirk suspects to be the beginnings of life. Even if we believe the sensors register microbes from orbit as lifesigns, and despite a comparably long conversation, no-one explicitly talks about the inconsistency of finding advanced technology on the one hand and only primitive life on the other hand. Kirk treats the holograms as if they were actual people, although they are just representations of the respective cultures of lifeforms. And even after returning to the Enterprise, when it is clear everything was a test set-up, Kirk still talks as if the attitude of real civilizations had genuinely been changed. While the story was severely lacking, I liked how on various occasions during this episode, the landing party requested help from the ship in orbit. This is only realistic, given that landing parties can only carry limited amounts of equipment, and the planet-side mission would probably be permanently observed by the OPS officer on the ship. The episode is moderately interesting to follow (which is entirely the result of various nice-looking screens and the quite logical interactions), and lastly, it deserves some minor praise for truly conveying the arrival at and exploration of the surface of an unknown planet. Sensors cannot scan the ground, and communications will be unreliable while on the planet. Yet, Spock says it is safe to beam down. Spock says the hand phasers are too weak to create the "energy level" to generate geothermal energy. Instead, McCoy suggests "starship phasers on a microwave setting". Are hand phasers, which, on other occasions, have been used to make rock glow red, really too weak to create a below-ground temperature of 345K (~72°C)? Or is it rather the spread of the beam that needs to be less focused? Spock says the phaser beam from the starship phaser needs to be "extremely precise", however, what we see is indeed a rather wide beam. Spock speaks of "[number] degrees Kelvin". He of all people should be saying "[number] Kelvin", given his obsession with precision witnessed on other occasions. The two initial species are called Alphans and Omegans. They are associated with the colors blue and yellow, respectively (as evidenced by the holograms and the petri dish colors). They see themselves as representatives of darkness and light (this is also reflected by the locations of the holograms). They are represented by holograms of a demon and an angel, respectively. The Alphan petri dish feels cold, the Omegan one feels warm. The Alphans have very short lifespans, the Omegans have very long lifespans. The Alphans have an extremely high rate of reproduction, the Omegans have a very low rate of reproduction. The merged species is identified as Gammans. Their petri dish is green. They are viable for long-term existence. Curiously, while Alpha and Omega mark the beginning and the end of the Greek alphabet, Gamma is the third letter and not even close to the middle. It is a stretch that the installation on the planet (including the single-celled lifeforms) is supposed to be 50,000 years old and still fully functional. Has no-one else ever found the installation in all that time? Curiosity: At one point, Kirk muses: "After our encounter with the Elasi, the Vardaine, and their replica of the Enterprise, I can appreciate a few less stressful missions." He is referring to the last episode from 25th Anniversary, which is already quite a bit in the past. I wonder whether this episode was originally supposed to be placed earlier in the game. Continuity: Spock mentions "Dr. Daystrom's M-5 computer program" as an example of artificial intelligence. In the dangerous Antares Rift, a member of a species thought to be extinct abducts Spock from the battered Enterprise. When a landing party follows the alien by beaming into another dimension, they encounter a being called the Savant that amplifies emotions of other telepathic beings. Misjudging Spock's mental discipline, the Savant has given Spock joy as a gift, but can be convinced by Kirk to grant Spock the freedom to control his emotions again. Concerning feeling like in a true Star Trek episode, this episode is a highlight: For the first time during the game, we can walk around in some places inside the Enterprise and have interactive dialogs with the crew. The story is solid and feels believable, as the crew are confronted with credible obstacles and take logical steps (for instance, when Uhura determines the ship's communication systems have been rendered unusable, she uses the communication systems of a shuttlecraft instead). The dire situation with the heavily damaged ship that is regularly shaken by explosions, and the constant snarky remarks especially by Sulu and Chekov somehow manage to hold a balance, without causing the excitement and the humor to distract from one another. As soon as we see the other dimension, storytelling becomes less interesting, though. The landing party becomes rather passive as the crewmembers conveniently find everything they are looking for within a few steps around their point of arrival - the Vurian, Spock, and the entity Savant. Moreover, as Spock can already readily explain what is happening, all that is left to do for the landing party is convince Savant to release Spock. In the end, this feels similar to the various instances of Kirk discussing a computer to death, and it does not get more inspiring by the formulaic plot device of spheres that represent different emotions. Still, this segment of the story makes sense as a conclusion to what began on the Enterprise. In all, this episode depicts an interesting adventure and a villain that turns out to be not so villaineous after all and who has a somewhat reasonable motivation instead. Despite the shortcomings in the second half of the story, I thus rate this episode with 7 points. On a final note, I liked Sulu's remark about the U.S.S. Regulus having been invaded by five different alien species within the course of one year. This is one of the few statements that confirm the Enterprise is not the center of the universe and other ships are having just as exciting a history. Spock says, the "sensors are too heavily damaged here" (on the bridge), which is why he has to go to auxiliary control and reroute them from there. This does not sound realistic, as the actual sensors are not located in either of these places, but would rather be distributed on the outer hull of the ship. The control panels on the bridge might be damaged, but we do not see any traces of destruction there. It seems the data network between the bridge and the rest of the ship has somehow been damaged while leaving the interior of the bridge unscathed. According to Scotty's initial assessment, they'll "need a Starbase to make this bridge functional again", which is why the crew attempts to get to auxiliary control in the first place. After returning from the other dimension, Kirk confirms that the Enterprise is en route to a Starbase, but he does so from the main bridge, with everyone at their usual stations. Maybe the damage was not as extensive as assumed at first? Remarkable scene: Kirk picks up the emotion spheres one by one, and utters a few lines under the distinct impression of the respective emotion before his mind becomes clear again. One of the spheres causes Kirk to express a deep fondness for everyone in the away team, for instance, by praising Chekov for "all of those wonderful Russian jokes". By having the members of the away team touch the stones, several of them refer to various TOS episodes. A landing party from the Enterprise is asked to attend a ceremony during which an ancient probe is going to be returned by a museum of technology to an influential family from the probe's planet of origin. When terrorists take hostages, the landing party have to use pieces of the museum exhibits to override the museum lockdown. The terrorists do not consider the original recipients to be the rightful sole owners of the probe, but agree to participate in a mediation managed by the Federation. In short: Kirk, Scotty, and Chekov wreck a museum. Story-wise, this episode is very thin. Nonetheless, the museum-of-technology-setting lends itself to the gameplay, as it does not seem contrived to find random bits of technology lying around. While playing this episode, it is simply fun to get lots of background information about the various exhibits, and to disassemble them in order to work around the museum lockdown. Despite there being not much of a story, the episode could have been made more dramatic. While the banter between Kirk, Scott, and Chekov was not over the top, it sometimes seemed a bit unwarranted given the situation. It is almost as if the landing party had foreseen the terrorists are ready to talk - as will be the case when they immediately release the hostages after being promised a chance to explain their situation. In all, this episode is not very interesting to follow, but good to play, and thus gets 5 points. Murnane VIII, an early transporter "from a time before transporters were safe for travel by living beings"
An old communications console from a freighter named "Big Bear Running"
A sensor diagram from an early Terran interstellar craft named "Remembrance"
Given that Vulcans used to possess some advanced technology such as nuclear weaponry already in the days of Surak, almost two millennia before TOS, it is questionable whether an "early Vulcan computer" could still be in the depicted state. Of course, this is by far not the only instance of still functional ancient technology on Star Trek. The room with the Lachian probe also sports a model of an ancient Lachian temple. While the description says the exhibit is there in honor of the Lachian guest (and thus temporary), it is questionable whether a museum of technology would choose to display a model of an ancient temple for anything. But then, the curator's office also contains what looks like a medieval knight's armor. Continuity: While talking to the terrorist via the communication station, one of Kirk's dialogue options is to threaten the terrorists with a "corbomite device". After a brief encounter with the Romulans, during which they imply they too have been contacted by the Brassica, the Enterprise is sent to the Federation colony Atabis in the Klingon neutral zone. A large alien vessel is about to land on a populated area in the colony. The passengers of the alien ship, the Compassion, seem to suffer from a variety of mental disorders. There are signs that the shipboard computer system, named the Phays, has been malfunctioning and has awoken the passengers early from their cryogenic sleep. The away team has to deal with uncooperative passengers of the vessel, a Klingon landing party that keeps a close eye on the Enterprise crew, as well as the Phays that has lost access to its external sensors and therefore considers Kirk's claim about landing on an inhabited planet to be the result of a delusion. Eventually, the Phays can be repaired and processes the newly gained information about its surroundings. Based upon communication with the landing party, it determines the final "test" has been passed, and extends an invitation to meet its builders - the Brassica -, which both the Enterprise landing party and the Klingon Captain Klarr accept. This episode is enjoyable on most accounts. One can really say that the best was saved for the end. The diverse problems that the landing party faces, the constant threat by the Klingons who are still not overly obnoxious with their desire to keep an eye on the Enterprise team (or at least, they "happen to randomly" turn up a few moments after the Enterprise landing party in most of the rooms), the interaction between the crew and the inhabitants of the Compassion - all of these make the story feel well laid-out and not too short. In this respect, it was also a good decision to use the first half of this two-parter as a way to tell its own sub-story, only to reveal in the end that it was all the build-up to a second part that is going to provide a conclusion to the Brassica story arc. The properties and inner workings of the Compassion seem reasonable, and it is a pleasant surprise that the computer system turns out to be truly damaged. The constant joyful voice made me suspect it was intentionally lying and had malicious intentions, in the tradition of computers rebelling against lifeforms. Instead, the exhibited malfunctions can be reasonably attributed to the lack of sensor input and reliance of the information the computer was originally fed with. Despite some talking about it, the historical background of the Compassion does not become entirely clear. The computer thinks it has been underway for 280 years, whereas Spock surmises it must be more like 1600. The ship is designed as a sleeper ship meant to awaken its passengers shortly before landing, but the computer implies it has become a generational ship instead, even though the landing party agree it cannot work as one. Indeed, it would be a stretch to assume that a ship designed as a sleeper ship could keep its awoken passengers alive for several generations, even with a computer like the Phays caring for them. Likewise, the true purpose of the Compassion is not fully explained, and it remains an open question whether everything is just another test setup, or whether it just doubles as a test. As is in-character for McCoy, he develops a strong dislike for the builders of the Compassion when it appears to him they tried to get rid of all the people with mental disorders by shipping them off into space. While I can understand his qualms at first, he ignores a part of the (possibly true) background information that the builders may have tried to buy themselves more time to find cures. The Klingon Captain Klarr leaves a positive impression as a Klingon who does not stereotypically see violence and destruction as the only option. Instead, he is open for putting aside differences with the Federation for as long as the situation at hand is not solved, he refrains from shooting without first watching what happens, and he offers his assistance based on an apparent aptitude for engineering problems. With his emphasis on honor, and his appearance as a TOS Klingon seen speaking the Klingon language, he appears as a bit of a link between the Klingon culture as shown in TOS and in later series. On a few occasions, though, Klarr is so diplomatic that I became worried he is making himself a target for the next Klingon-style promotion, especially considering the outspoken hostility by his aide. Only in the end of the episode, he shows he can carry his point when he knocks out his aide for disagreeing with the decision to accept the invitation by the Brassica. Visually, it seems that the drawing style has matured by this episode. While some formerly seen alien locations evoked a feeling of a generic science fiction place with (overly) colorful backdrops, the locations in this episode look like they could really be sets in a Star Trek episode. In all, the episode is exciting to follow and works well with the large number of characters it features. Adding Uhura to the landing party instead of another unknown redshirt was a good idea, once again letting her appear to be more proactive and professional than in most original TOS episodes. Inconsistencies: Given that the builders of the Compassion never had any contact with Earth or the Federation before, there is no explanation for the Earth references found on the ship: The greenhouse contains devices numbered with Arabic numerals. Likewise, there is a game of chess, which seems to work precisely the same as our chess (or at least of a type of chess that Spock is immediately able to play and win). During the brief detour to the Romulan Neutral Zone, the crew consistently talk about a Romulan "Warbird", but what we see is an ordinary Romulan Bird-of-Prey. The Romulan Commander Starius is wearing a blue uniform. During their few appearances on TOS, higher-ranking Romulans seemed to be wearing red. Remarkably realistic observation: Upon talking to the Phays for the first time, Kirk wonders whether the Phays are a hive mind or whether they are just using a voice synthesizer that outputs "a harmonic chord of voices". Visual or audio special effects are rarely explicitly described on Star Trek (in the TV series, this is likely because the decision on the exact appearance/sound of special effects is made only after the dialogs have been recorded). On other occasions, more often than not, characters tend to jump to conclusions instead of explicitly describing what the audience sees. Remarkably realistic treating of translation issues: The Phays first indicates the length of its voyage in one of its native alien units of time, whereupon Spock asks it to express the timespan as a factor to the half-life of a radioactive isotope. Continuity: Kirk suggests to employ illogical behavior to confuse the Phays (the same tactic as in "I, Mudd"), which Spock dismisses by pointing out that the Phays itself does not appear to act entirely rationally and does not seem to have a problem with it. Kirk, Spock, McCoy, Uhura, and the Klingon Captain Klarr are subjected to a series of riddles by the Brassicans. After the seemingly last question, the Brassicans bring the five visitors to their planet and express a desire for diplomatic relations. Kirk is provided with a storage device containing scans of Klingon space by the Brassica. Instead of using the knowledge for strategic purposes, he talks to Klarr, who has been given equivalent data about Federation space. Kirk and Klarr agree to destroy both storages, reaffirming their trustworthiness to the Brassica. As a stand-alone episode, this episode would be pretty thin, but as a conclusion to the Brassica story arc, it feels rewarding. This, however, is mostly the merit of the gradual introduction of the Brassica throughout the game, which let them appear powerful and mysterious. What we see now is not much, and boils down to the mere intention of establishing peaceful relations with both the Federation and the Klingon Empire. The simplicity at which this agreements happens feels reminiscent of the overly brief encounter with the Nauian in the first episode of 25th Anniversary. Nonetheless, Judgment Rites does not repeat the mistake of the earlier game to conclude a story-driven game with a difficult space battle against a "big boss". Instead, peaceful relations with an advanced species are initiated, which feels also more appropriate with respect to the spirit of Star Trek. Unfortunately, the Brassican tests themselves are not very convincing. It is just not credible to draw any useful conclusions from a small set of highly abstract questions to a small random set of representatives (here: Kirk, Spock, McCoy, Uhura, and Klarr), least of all to determine very specific qualities such as leadership and willingness for sacrifice. Bearing in mind how the previous two tests were conducted in the episodes "Sentinel" and "Light and Darkness", I did not truly expect more sophisticated testing methods, however. On the other hand, the very last test about the strategic data seemed more valid, even though it once again can only allow statements about Kirk and Klarr in particular. Any other Klingon commander might easily have interpreted the framework of honor differently, for instance. What does come as a bit of a letdown is that the Romulan involvement from the beginning of the previous episode is not followed up to. We never learn what the story behind the "rogue" vessel was that the Enterprise destroyed in the beginning of "Though This Be Madness...", and we can only surmise the Romulans were considered by the Brassica, but failed their tests at an earlier stage. Speaking of which, one has to wonder how the Klingons got this far, or whether they were given different tests before. In all, this episode rates lower than the first part of this two-parter, and draws its score mainly from the fact that it provides a fitting conclusion to the game's main arc. Inconsistencies: In the previous episode, the last information we got on the starship Compassion was that it entered an orbit around Atabis until receiving appropriate landing coordinates. In this episode, after passing the tests, the Brassica state that the Enterprise and the Klingon vessel Pao Yar will be summoned to the Brassican planet. Yet, after returning to the Enterprise, the Enterprise and the Pao Yar are still seen next to the Compassion. 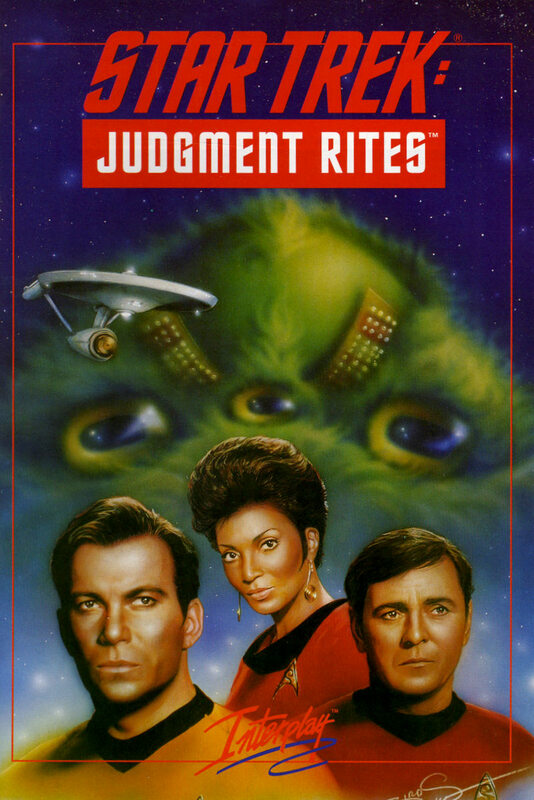 Judgment Rites has few clearly outstanding episodes, but instead gives us a set of mostly enjoyable episodes as well as a story arc that continues through several episodes. Comapared to 25th Anniversary, it was good to allow for more variation among the landing parties. Where the previous game always had Kirk, Spock, McCoy, and a redshirt, Kirk is sometimes accompanied by different people in this game. This way, Scotty, Uhura, Sulu, and Chekov all get to do a bit more in some of the episodes, and we also meet some more diverse crewmen of the Enterprise than only security officers. For the shipboard parts of missions, it is a relief that the space battles have been toned down and thus, more focus is put on the story - on the easiest difficulty level, space battles on locations the Enterprise is ordered to travel to are usually completely absent, and the game ends with a final series of conversation-based tests of worthiness rather than with a final space battle. The technical quality of the game is on a comparable level as in its predecessor. The user interface was not changed, which allows players to focus on the story. The visual quality of space cutscenes was improved, as 3D animations were used now. This allows for more dynamic exterior views of starships. One example is the short cutscene showing the Enterprise going to warp after the player has selected a destination, which now depicts the TOS ship with what looks like a mixture of the TMP and TNG warp effects. Some other graphics have been improved, as well; for example, the Elasi captains now appear a lot meaner on screen than in their previous "leather pilot jacket" appearance. The only slight gripe is that especially during the later episodes, a few of McCoy's lines were misread. Once again, references to the known Star Trek universe are sufficient to make the game feel like Star Trek, yet there are also plenty of details newly added to the universe. This is not entirely the fault of the game, though, as back in 1993, there simply was not yet as much canonical material to draw from as there would be later. In all, the game can be seamlessly played after 25th Anniversary and maintains the same high standard of TOS-based point-and-click adventure missions.